Herbs, perennial, 3-8 dm. Stems prostrate, villous. Leaves sessile; blade oval to obovate, usually as broad as long, 1.3-3 × 1.1-1.7 cm, apex rounded, pilose, glabrate. Inflorescences axillary, sessile; heads stramineous, globose to ovoid, 0.6-1 × 0.6-0.7 cm; bracts equaling tepals, apex attenuate. Flowers: tepals dimorphic, stramineous, lanceolate, 5-7 mm, apex acuminate, spinose tipped, sparsely villous, hairs barbed; stamens 5; anthers 3-5, globose; pseudostaminodes triangular, shorter than filaments, margins dentate. Utricles included within tepals, brown, compressed, 1.8 mm, apex truncate. Seeds lenticular, 1.3-1.5 mm. Flowering summer-fall. Waste grounds, cleared limestone areas; 0-1500 m; introduced; Ala., Fla., La., N.Y., Tex. ; West Indies; South America. Alternanthera pungens was long known as A. repens (Linnaeus) Link, a later homonym of A. repens J. F. Gmelin. 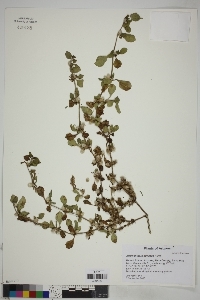 Duration: Perennial Nativity: Non-Native Lifeform: Forb/Herb General: Perennial herb from a thick, woody, vertical root; stems prostrate and mat-forming, 30-80 cm, herbage villous. Leaves: Opposite, sessile, oval to obovate, the pairs generally unequal, 10-30 mm long and 10-17 mm wide, apex rounded, surfaces pilose to glabrate. Flowers: Green with conspicuous white bracts, borne in small condensed spikes in the leaf axils; the spikes globose to ovoid, 6-10 mm long and 6-7 mm wide; flowers sessile, subtended by attenuate bracts which equal the tepals in length; tepals 5, stramineous (chaffy and straw-like), lanceolate, 5-7 mm, apex acuminate, spine-tipped and sparsely villous with stiff, jointed and barbed hairs; stamens 5; anthers 3-5, globose; pseudostaminodes triangular, shorter than filaments. Fruits: Utricles included within the tepals, brown, compressed, 1.8 mm, with a trucnate apex; seeds lenticular, 1.5 mm. 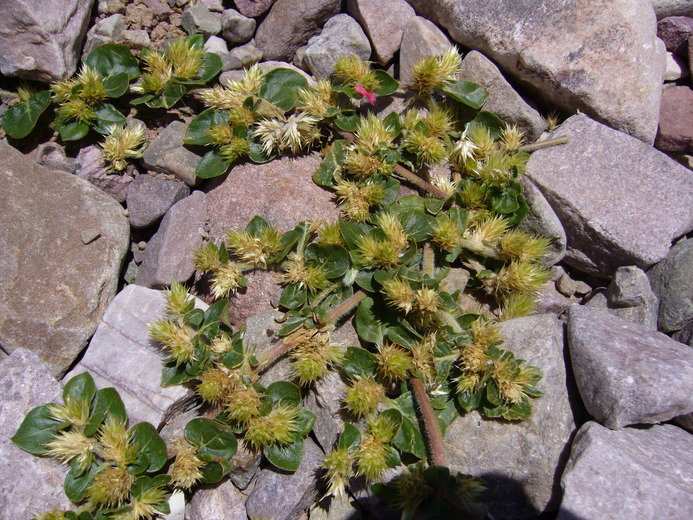 Ecology: Found in waste grounds and cleared limestone areas, from 0-5,000 ft (0-1524 m); flowering summer-fall. Distribution: Native to South America. FNA notes occurrences in AL, FL, LA, NY, TX, and the West Indies. USDA Plants also includes GA, SC, HI, and VA. Herbarium records from SEINet show the species in se AZ (Pima, Cochise, and Santa Cruz counties) and s NM (Grant and D Ethnobotany: Unknown. Synonyms: Achyranthes leiantha, Achyranthes repens, Alternanthera achyrantha, Achyranthes repens Editor: LCrumbacher2012, AHazelton 2015 Etymology: Alternanthera comes from the Latin alternus, "alternate," and anthera, "anthers," referring to the alternating stamens and staminodia; pungens means spiny, sharp-pointed.